The cheapest value ticket now exceeds $100 after increasing from $97 to $104. One-day, one-park peak time admission is now $149. Ticket prices increased by an average of 8% overall, but is much more for some annual passes. The Signature pass is up 15% and the unrestricted Signature Plus by a whopping 22%. The cheapest day ticket for DisneyWorld in Orlando is now $109. “We continue to provide our guests with a variety of ticket offerings to meet their needs, while helping us to spread visitation, better manage demand and deliver a great experience,” Disneyland said. Disneyland parking increased by 25% from $20 to $25 a day, with the hourly rate rising by $2. 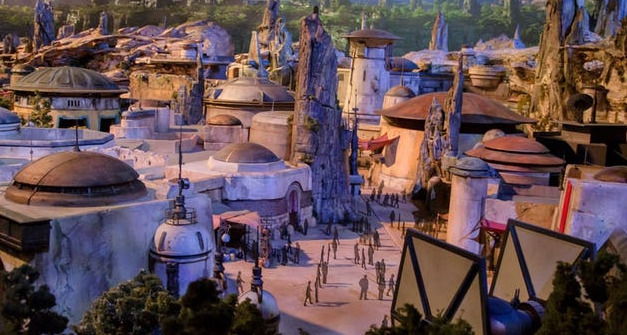 The ‘Galaxy’s Edge’ experience opens in June in Disneyland and later this fall at Orlando’s DisneyWorld.